A Staffordshire entrepreneur is living out his childhood dreams after buying the Great Gear Store and moving the business to Leek. Carl Barlow has created six jobs in his home town and is using his skills as a digital marketer to grow the business. 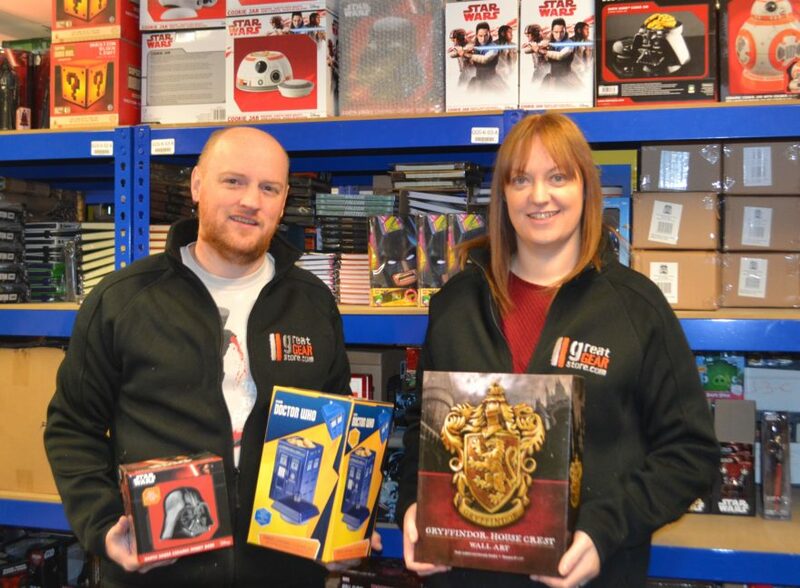 The Great Gear Store is every schoolboys dream, with thousands of collectable items in stock such as Star Wars figures, Harry Potter wands and pop and rock merchandise. “I bought the business as a going concern in late Autumn and was immediately thrown into a whirlwind of Christmas sales, shipping out over 5,000 items from Beatles memorabilia to up to the minute TV themed memorabilia from programmes such as the Walking Dead. Growing the online side of the business fits seamlessly with Carl’s expertise. Having worked in the digital team at the former Britannia Building Society headquarters, in Leek, Carl founded an online digital marketing company, Digital Eyes Media, in 2012. Further developments for the future include the possibility of a trade counter in Leek and Carl is also planning to introduce a Great Gear Store loyalty club where members can pay a fee and sign up for monthly memorabilia, such as band t-shirts. “I believe this business has great potential. The market for memorabilia is continually growing and we have seen the growth of Comicon events across the UK in recent years. “The breadth of stock that we hold is huge. There’s a collectors’ market for virtually any theme you can think of and for all age ranges. For example, we have already sold a large amount of John Wayne themed gear, such as wallets, mugs and hip flasks, and there’s also more than half a century of pop and rock memorabilia, with collectors wanting to buy items from different eras, from Elvis, through Motorhead, to Oasis. To find out more about the Great Gear Store please go online to www.greatgearstore.com. For media enquiries contact Nigel Howle – 0776 20434336, nigel.howle@howlecom.co.uk.